A lighthearted but spicy bouillabaisse, New Orleans–set, by Texas journalist Davis (American Voudou, not reviewed). Corina Youngblood may never have made it through divinity school, but she’s a bona fide priestess of santeria, the African mélange of Christianity and animism that arrived with the slaves and still survives. 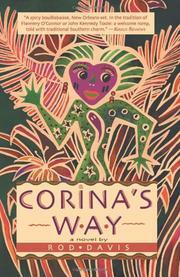 The proprietress of a small botanica in New Orleans, Corina dispenses spiritual advice and herbal remedies to her modest but loyal clientele who come to her with complaints about everything from their teeth to their love lives. It’s not a gold mine, of course, but Corina gets by—until the Delgado brothers try to run her out of business. Cuban immigrants with oversized egos and ambitions to match, Elroy and Julio Delgado have come up with the idea of launching a SuperBotanica (“a Wal-Mart of spiritual supplies”), and the site they’ve chosen is just a few blocks from Corina. She has to branch out, fast, or she’ll be undersold within a year. Fortunately, Corina has just made the acquaintance of Gus Houston, chaplain of Miss Angelique’s Academy for Young Ladies in the ultra-posh Garden District. Not much of a preacher (he was never ordained and has barely read the Bible), Gus sits in his office all day, listening miserably to the complaints of spoiled rich teenagers. In desperation one day he refers one of his whining charges to Corina, who solves the girl’s problems in half an hour and works out a referral scheme with Gus. Soon white debutantes are streaming through Corina’s door in search of spiritual enlightenment, and she’s running in the black for the first time in years. Gus, more popular at school than ever, begins sleeping with the headmistress and organizes a Gospel choir that performs in the New Orleans Jazzfest. Still, though, the problems with the Delgado brothers haven’t gone away. In the tradition of Flannery O’Connor or John Gregory Toole: a welcome romp, told in an old-fashioned style and with traditional southern charm.